The new CR1000 datalogger has the toughest competition in the industry, the CR10X. Look at the CR1000 and you see the resemblance; the electronics are protected and electromagnetically shielded in a stainless steel can. To keep the per-unit cost low for remote stations or large networks, the wiring panel does not have a built in keyboard or display. Yes, the CR1000 is designed to take on the multitude of applications that the CR10X handles—and more. The CR1000 is truly a new datalogger and not merely an upgrade. Its communications capability and support for intelligent sensors set it apart. Several features that were pioneered in other dataloggers have been enhanced and now hit the mainstream with the CR1000. For example, the CR9000X, CR5000, and CR200-series dataloggers share the CRBasic programming language. PAKBUS® communications have been available in the CR510, CR10X, and CR200 dataloggers. The CR1000, in conjunction with our datalogger support software, will extend those benefits to more users. The CR1000 has the most versatile blend of measurement and digital input/output capabilities of any datalogger currently manufactured by Campbell Scientific. For communications and data storage there are an RS-232 port, a CS I/O port, and a parallel peripheral port. For measurement and control there are eight differential/sixteen single-ended analog inputs, three switched excitation channels, two pulse inputs, 12 analog grounds, six power grounds, one 5 V terminal, two 12 V terminals, one switched 12 V terminal, and eight digital I/O terminals. The analog inputs offer incremental improvements from the CR10X. The CR1000 has two more differential channels. A ±5 volt range allows inputs of sensors with a 5 volt output without the use of a voltage divider. On voltage ranges up to ±250 millivolts, a full line cycle integration option provides improved rejection of 50 or 60 Hz noise. As an indication of the speed, at the minimum scan interval of 10 milliseconds (100 Hz measurements) the CR1000 can measure and store the results from all eight differential channels (800 measurements per second). At the same scan interval, it could measure and store results from 13 single-ended channels (1300 measurements per second). 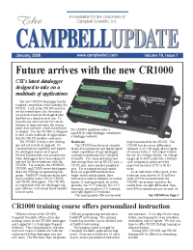 Campbell Scientific designed an application-specific integrated circuit (ASIC) for the CR1000. Initially, the custom ASIC was evaluated as a way to save some costs in the signal conditioning circuitry for the pulse inputs and power supplies. As we proceeded with the ASIC design, we found more ways we could use it. For example, the ASIC controls the measurement sequence and timing, freeing up the CPU for faster processing and data storage. Pulse count inputs and all digital I/O ports have the ability to count pulses using 24-bit counters that handle the maximum input frequencies. Earlier dataloggers had 16-bit counters that needed special treatment for higher frequencies. The ASIC also handles serial communications on the CS I/O, the RS-232, and the digital I/O ports. The hardware will support timing between signal transitions and between transitions of different signals, similar to SDM-INT8 functionality. This edge timing is not supported in the first release of the CR1000 Operating System, but will be available later for download. Pulse count inputs count switch closures, "high frequency," and low-level AC signals. The digital I/O inputs count switch closures and "high frequency" signals without additional signal conditioning. Digital I/O ports can also be used to count low-level AC signals with the addition of the LLAC4 module. The peripheral port is a parallel communications port introduced with the CR1000. The CFM100 CompactFlash® Module will be the first peripheral supported by the port. The CFM100 will expand the CR1000’s memory using Compact Flash media.